Don’t watch ISIS’s murder of Steven Sotloff: Honor him by remembering the thousands of others the jihadists have killed. The best way to honor James Foley and Steven Sotloff is to remember the thousands ISIS has murdered, and to stop them from killing thousands more. 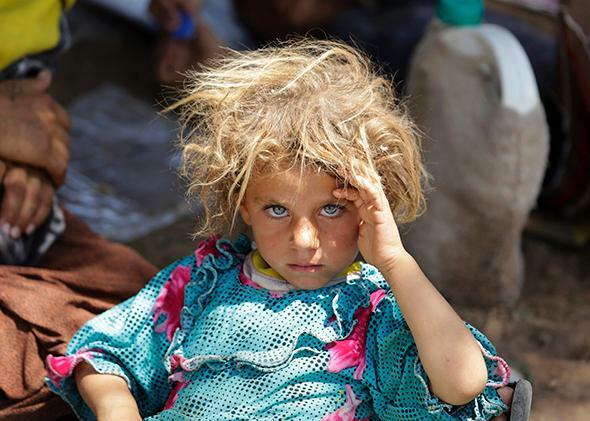 A Yazidi girl, fleeing the violence in Sinjar, Iraq, rests at an Iraqi-Syrian border crossing on Aug. 13, 2014. ISIS has released another beheading video. Two weeks ago, it posted a video of an ISIS fighter decapitating U.S. journalist James Foley. The new clip shows another reporter, Steven Sotloff, meeting the same end. A third video, released several days ago, featured the execution of a Kurdish fighter. A fourth victim, a British aid worker, is expected to be next. Maybe you’re tempted to watch these videos. Or maybe, like me, you feel as though you should. (The links above show only the transcripts.) Foley and Sotloff died because they were Americans. They could have been any of us. Don’t we owe it to them to witness their murders? No. We owe them something else. These executions are what ISIS wants you to see. They’re designed to scare the United States out of Iraq and Syria, allowing ISIS to continue its rampage. The people for whom Foley and Sotloff risked and lost their lives were ordinary Syrians and Iraqis. They’re the people ISIS has butchered by the thousands. The best way to honor Foley and Sotloff is to face those murders, and to stop ISIS from committing thousands more. Start with Monday’s testimony before the U.N. Human Rights Council. The documented incidents include 1,700 captives executed in Tikrit, Iraq, and 650 in Mosul, Iraq. Some 1,000 Turkmen massacred, including 100 children. More than 2,000 women and children kidnapped. “Systematic hunting of members of ethnic and religious groups.” Women raped and sold. Young boys executed. Girls enslaved for sexual abuse. Children recruited as suicide bombers. More than 1 million refugees, half of them kids. Then read the report Amnesty International issued Tuesday. Its title is “Ethnic Cleansing on Historic Scale: The Islamic State’s Systematic Targeting of Minorities in Northern Iraq.” The report details, with eyewitness testimony, several more ISIS atrocities in Iraq. At least 100 men and boys herded together and shot to death in Kocho. “Scores of men and boys” summarily executed in Qiniyeh. More than 50 men “rounded up and shot dead” near Jdali. Human Rights Watch also released a report on Tuesday. It offers new evidence about the massacre in Tikrit. “Information from a survivor and analysis of videos and satellite imagery has confirmed the existence of three more mass execution sites,” says the report. That brings the death toll to “between 560 and 770 men.” The captives were shot dead while lying in trenches with their hands bound. For a more complete tally of the carnage, check out the U.N.’s latest casualty figures for Iraq. The 1,265 civilians killed in August, combined with 1,186 in July and 1,531 in June, yield a total of 6,861 so far this year, and 9,826 over the last 12 months. The report doesn’t specify how much of the killing was done by ISIS, but it does say that “thousands continue to be targeted and killed by [ISIS] and associated armed groups simply on account of their ethnic or religious background.” These figures don’t include the uncollectible data from Anbar province—which covers half the Syrian border and nearly one-third of Iraq—or any of the nearly 200,000 people killed in the Syrian civil war.